Following is a summary of current sports news briefs. The Golden State Warriors celebrated their final regular-season game in Oracle Arena with a third-quarter explosion Sunday night, producing a 131-104 win over the Los Angeles Clippers in Oakland, Calif., that clinched top seeding throughout the Western Conference playoffs. The win was Golden State&apos;s fifth in a row and 30th of the season at home. Following is a summary of current sports news briefs. The first woman drafted into the NBA 2K League almost never had her crowning moment as sexism from fellow players convinced the trail-blazing gamer to flee an event where prospects were being evaluated. Chiquita Evans wanted to be a part of the NBA&apos;s esports arm for its inaugural season in 2018 but did not anticipate the resistance she met while at the Combine, the second stage of qualifying for the draft. The miss on the second one bounced high off the rim and was rebounded by Andre Iguodala, securing Golden State&apos;s victoryGOLF OKLAHOMA CITY (AP) - Russell Westbrook scored 31 points in his 26th triple-double of the season, and the Oklahoma City Thunder beat the Brooklyn Nets 108-96. Westbrook added 12 rebounds and 11 assists for the 130th triple-double of his career. Paul George scored 25 points and Jerami Grant added 15 for the Thunder, who shot 49 percent in the second half. Curry got the 76ers&apos; attention with five 3-pointers and 28 points to rally the Warriors to a 120-117 win over Philadelphia on Saturday night. Curry seemed invisible in long stretches, especially in the third when he played just 3:45 of the quarter and watched the 76ers keep competitive in his absence. 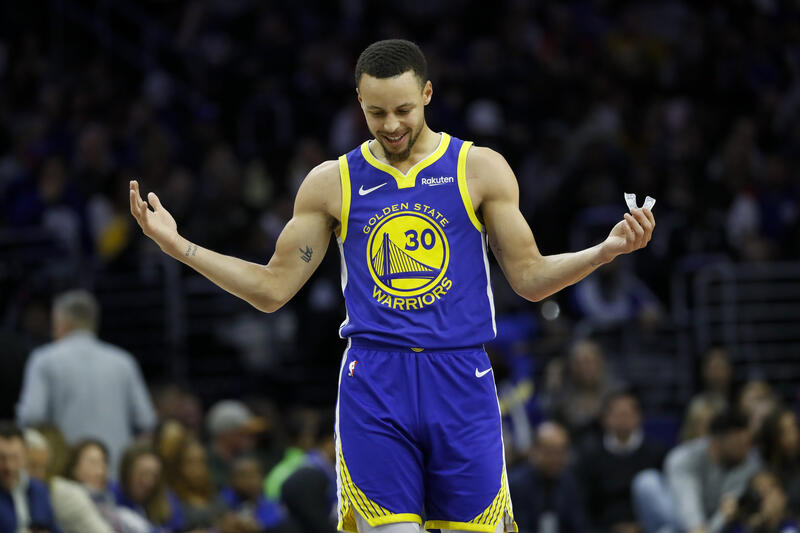 With Curry back in the lineup in the fourth, the Warriors squashed Philly&apos;s upset bid in front of a sellout crowd that included plenty of Philadelphia Eagles and the first appearances of Philadelphia Phillies Bryce Harper jerseys. Golden State Warriors head coach Steve Kerr took a jab at those who hate on dynasties, such as his Warriors. In front of a media backdrop that read “back-to-back champions,” Golden State Warriors head coach Steve Kerr took on the most asked question in the sports world Monday. DeMarcus Cousins is looking forward to ending almost a year out with a ruptured Achilles and debuting for the Golden State Warriors, who he believes are the "most hated team in sports". All-Star center Cousins joined the reining NBA champions in free agency on a one-year deal despite going down with injury when playing for the New Orleans Pelicans against the Houston Rockets on January 26 of last year. The 28-year-old is expected to make his long-awaited return when the Warriors take on the Los Angeles Clippers at Staples Center on Friday. The Golden State Warriors may have secured dynasty status with their third NBA title in four years, but that didn&apos;t make them the best team of 2018. Other championship teams, including the Philadelphia Eagles, Villanova Wildcats and Alabama Crimson Tide, were in the conversation but fell short of that honor, as well. Based on a ranking by FiveThirtyEight, the best team across (almost) all sports in 2018 was none other than the 108-win, World Series champion Boston Red Sox. The Golden State Warriors lost single-digit games in 2015-16, but lost to the Cavs in the finals. The 2007 New England Patriots went an absurd 16-0 in the NFL, but didn’t win the Super Bowl. Atlanta has a one-point lead on the New York Red Bulls, and a one-goal lead in differential. Golden State Warriors forward Draymond Green has called the suspensions handed down by the NBA after the scuffle in the Los Angeles Lakers and Houston Rockets game "garbage". The Lakers&apos; Brandon Ingram received a four-game ban, while team-mate Rajon Rondo was given a three-game penalty and Rockets point guard Chris Paul&apos;s punishment was two games. You are currently browsing the archives for the Golden State Warriors category.